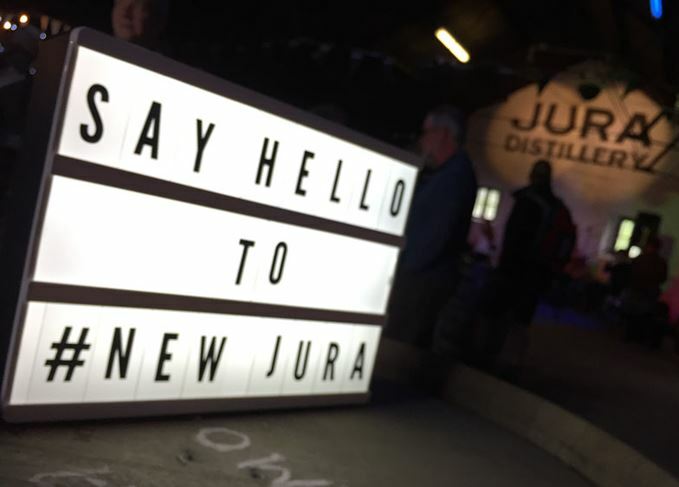 Islay Festival provided a launchpad for Jura’s new single malt range, while Kilchoman took the chance to show off its distillery expansion plans, including its new maltings. Becky Paskin reports from day six of Fèis Ìle. Fèis Ìle is a busy time for any distillery, but when you’ve just overhauled your entire range of single malts it’s an especially hectic period. Jura distillery, located half a mile off the east coast of Islay, has only recently discontinued its existing range and introduced nine new expressions, including four in travel retail. The distillery could be forgiven for forgoing its festival bottling this year when it has so many other new products to promote during its open day. The warm weather over the past week brought more than a few undesirable Islay locals out of hiding, but the midges were incessant on Jura. The scent of bug repellent hung in the air as daytrippers piled off the passenger ferry from Port Askaig and onto shuttle buses to take them the eight miles around the coast to the distillery. Respite could be found in the cooperage, which had been transformed into a dramming bar and live music venue, with cocktails and the new range available to taste to an upbeat, contemporary soundtrack courtesy of Uist band Beinn Lee. Among the cocktails was an Espresso Martini made with Jura 12 – quite why a peated whisky doesn’t have its own version of this classic is baffling, as the whisky’s subtly smoky undertones and vanilla sweetness work wonders alongside the flavour of coffee. Elsewhere, distillery manager Graham Logan took visitors on a tour of the plant, with a few personal tales racked up over his 24 years at Jura told along the way, while Jura whisky maker Gregg Glass led a fascinating masterclass, deconstructing the components that make up Jura Seven Wood from a sensory and scientific perspective. With the whisky matured in ex-Bourbon barrels and six different types of French oak cask, Glass demonstrated the effect that different oak species from different regions with varying char levels have on whisky’s aroma and flavour. How? By adding wood chips to our whisky and having us examine the grain structure of different oak types through a magnifying glass. ‘Seven Wood is one of the most interesting products in the range,’ he said. Jura shares its open day with Kilchoman, despite not being the closest two distilleries of the two islands. The usual farm tours on the back of a tractor, barrel-top tastings and bottle-your-own events returned, alongside tours of the distillery’s new maltings, only completed earlier in the week. The festival provided an opportunity for Kilchoman to bottle and release its oldest whisky to date, an 11-year-old ex-Bourbon cask-matured whisky distilled in 2007. Only 744 bottles were produced, all of which sold out by the end of the day. Distillery founder Anthony Wills was on hand to ensure that visitors were well-fed by manning the barbecue, but also took time out to tell Scotchwhisky.com’s Becky Paskin about how Kilchoman’s expansion plans are coming along. The second batch of festival bottlings: Kilchoman, Lagavulin, Laphroaig and Port Charlotte. Reflecting on a busy Islay Festival 2018, Becky Paskin presents her ultimate survival guide. Our round-up of Islay Festival bottlings starts with Ardbeg, Bowmore, Bunnahabhain and Caol Ila. A celebration of Port Charlotte’s relaunch took precedence on the second day of the festival. Our festival special ends with Bunnahabhain, Caol Ila, Jura, Kilchoman, Lagavulin and Laphroaig.